Quick Pitch: Sendible is a social media marketing platform that allows users to engage with their audience and track results across multiple social media channels at any time. 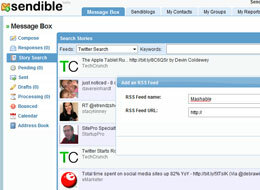 Genius Idea: Sendible lets you manage multiple social media accounts, schedule messages, send e-mail newsletters and SMS messages, and track performance and social mentions across different networks. 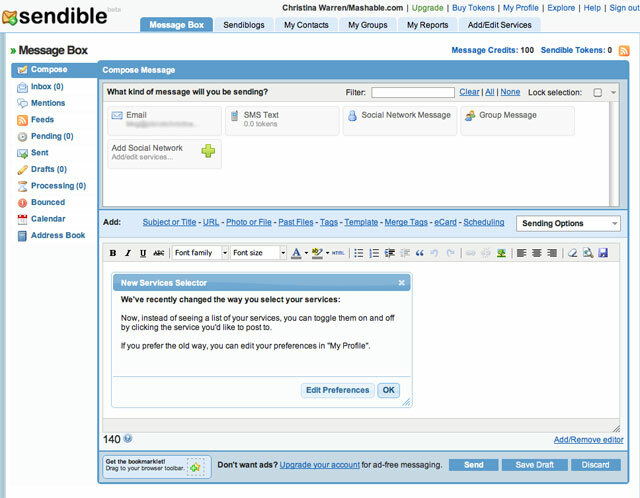 What we like about Sendible is that its interface is set up to resemble an e-mail or messaging system. You can choose how and when you want to send messages and send the same message from multiple services. You can also monitor mentions and RSS feeds all from the Message Box tab. Other tabs let you monitor and control more traditional publishing services, consolidate contacts across your networks, create customized groups of users to communicate with and draft tracking reports for clicks and other factors. 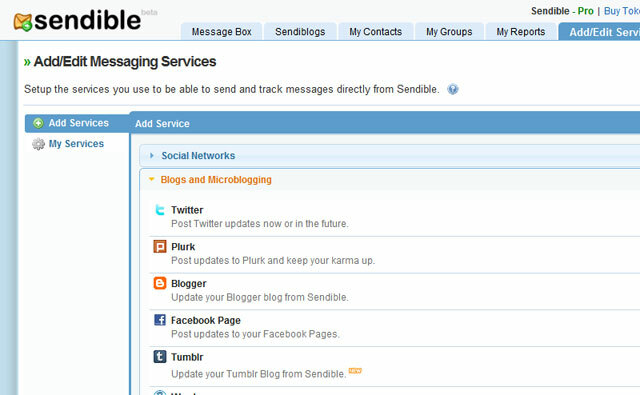 Sendible supports lots of different services, including Facebook, Twitter, Google Buzz, LinkedIn, BrightKite, and Foursquare venue tips. How many services you can use at one time is dependent upon what pricing plan you choose. The service is free for 100 messages a month, 300 contacts and four different services. Pricing scales modestly from $10 – $120 after that, depending on your needs. You can also buy SMS tokens in bulk if you want to use Sendible to send SMS messages to a certain group of customers or subscribers. It’s important to note that some networks, like Facebook, have multiple features that each count as a different service. So posting to a Group Wall and posting to your own page are considered different services. This can force users to upgrade to a higher-tiered plan if they want to use lots of Facebook services, even if they aren’t sending out more messages. If you are looking for a way to send and track messages through a variety of different services, Sendible is worth a look. Its SMS integration and options for e-mail newsletters set it apart from some of the other multi-service management tools. That’s a really awesome tool and long overdue. Thanks for the great review, Christina. We’ve just introduced an exclusive 20% discount code for Mashable readers when they upgrade to a marketer account. The discount code is “mashable”. I just signed up and sent my first message to my facebook group. Looking forward to using this in the future! Thanks for the info Christina! Another monthly fee!? No thanks. I’ll stick with Socialite. At least I only have to pay once for the program. If they made Mac native program that would be different. Just signed up and gonna test drive it for a month on Marketer plan. Looks good and much easier simpler interface than most of these tools. Thanks for the post. Whew, it is hard to keep up with everything. Mashable is a leading source for news, information and resources for the Connected Generation. 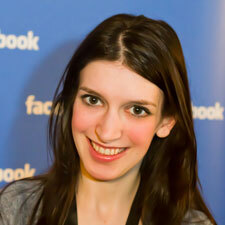 Mashable reports on the importance of digital innovation and how it empowers and inspires people around the world. Mashable’s 20 million unique visitors and 6 million social media followers have become one of the most engaged online news communities. Founded in 2005, Mashable is headquartered in New York City with an office in San Francisco.